In this article, we will learn about PrimeNG Picklist and DataView. The Picklist component is used to shift the data from one list to another list. It provides default buttons to move the data between different lists. In my previous article, we have learned about PrimeNG. You can check my previous article from the below mentioned link. Open SQL Server Management Studio and create two tables named "TeamA" and “TeamB”. 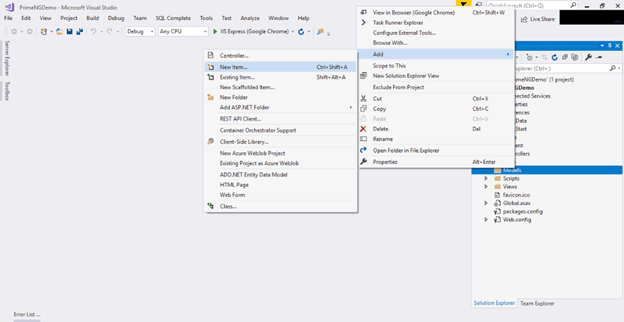 Open Visual Studio and create a new project. Change its name to PrimeNGDemo and select Web API as its template. Right-click the Models folder from Solution Explorer and go to Add >> New Item >> data. 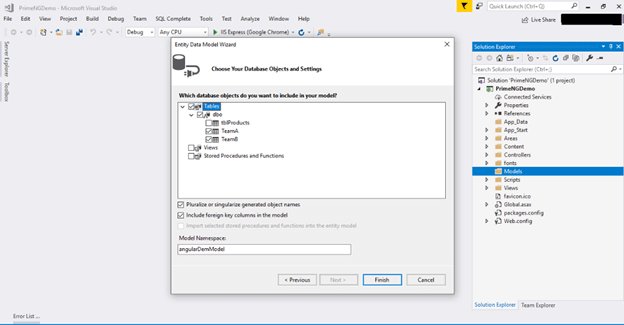 Click on the "ADO.NET Entity Data Model" option and click "Add". Select EF Designer from the database and click the "Next" button. Add the connection properties and select database name on the next page and click OK. The internal options will be selected by default. Now, click the "Finish" button. Our data model is created now. Right-click on the Models folder and a class - TeamOne. Now, paste the following code in the class. Right-click on the Controllers folder and add a new controller. Name it as "PrimeNG controller". Add the following namespace in the PrimeNG controller. Now, add a method to fetch data from the database. Add two new methods for inserting the data into database tables and add the following lines of code. The complete PrimeNG controller code will look like below. Now, let's enable CORS. 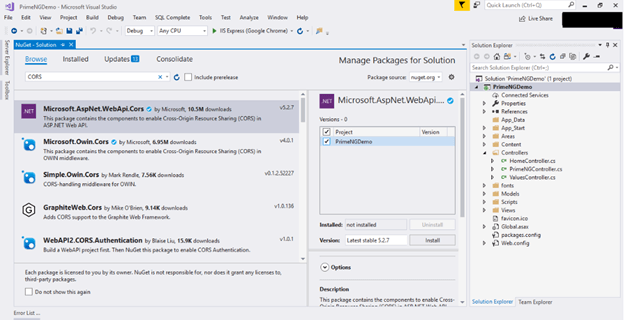 Go to Tools, open NuGet Package Manager, search for Cors, and install the "Microsoft.Asp.Net.WebApi.Cors" package. Create a new Angular project by using the following command. Open this project in Visual Studio Code and install the required packages for PrimeNG. The tenth step is Style Configuration. Configure the required styles at the styles section in angular.json file or styles.css. Now, create a component. To create the component, open terminal and use the following command. Create a class named "Team". 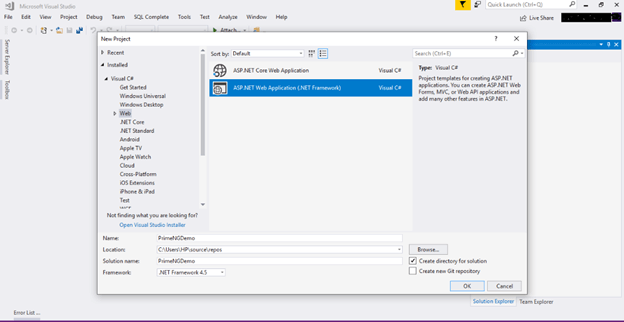 Create a service to call the Web API. Open the Team Service and import required packages and classes. Add the following lines of code in the team.service.ts file. Open pick-lsit.component.ts file and add the following lines. Open pick-lsit.componet.html and add this HTML. <p-pickList [source]="TeamA" [target]="TeamB" sourceHeader="Team A" targetHeader="Team B" [responsive]="true"
filterBy="Name" dragdrop="true" sourceFilterPlaceholder="Search by Name" targetFilterPlaceholder="Search by Name"
Configure PrimeNG module in app.module.ts file. Let's import the required module in this file. We are going to use Picklist and Dataview components in this demo, so add required modules for these components respectively. Now, run the project and check the result. Click on the arrow button to move data from one list to another and reorder the data in the list by clicking on the button given in the left side. In this article, we learned about PrimeNG Picklist and Dataview components. I hope you have found this article helpful.